She still looks older to me, but maybe that’s just because I know. It lingered so much longer than I expected. When Nicholas first left babyhood, he seemed like Julianna’s developmental twin. I expected it to last just a few months, but the twinning grew firmer and firmer. 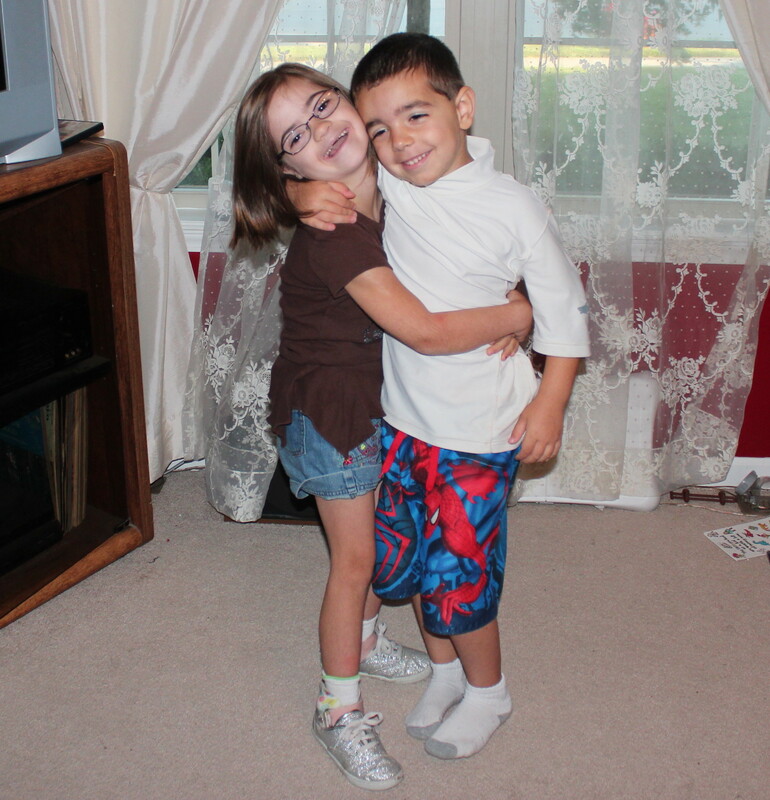 For over three years, they have kept pace with each other, Julianna managing to stay just far enough ahead in key areas–like reading, for instance–to counterbalance Nicholas’s exploding cognitive and speech capabilities. I should have realized, when I started referring to “the little ones” and meant Julianna and Michael instead of Julianna and Nicholas, that the twinning had passed at last. You should have seen the incredulous, rebellious look on my third-born’s face. How in the world did we miss this long enough for him to internalize a wrong-headed view of the world that thoroughly? Julianna keeps to herself a lot. She’s not big on playing; she likes listening to music and reading books. And swinging. She loves to swing. She’d still rather ride a tricycle than get on her bike, because she’s intimidated by the size–although she can ride it. She’s expected to do chores, but they’re the simple sort: pull the chairs out of the kitchen, bring the dishes to the sink. Meanwhile, Nicholas is learning concepts and play skills and chore duties by leaps and bounds. We intended to pull the training wheels off his bike this summer; I just didn’t get it done because my work load was heavier than I had realized. He outweighs her, although he’s still marginally shorter. He cleans the bathrooms (though not necessarily very well) and makes his bed. He’s writes as legibly as Julianna (which is to say, not very), although he can’t spell and she can. And this is all about to intensify, because Nicholas is starting kindergarten in a week. Since we held Julianna back, she’s only a year ahead of him in school. One of the things that comes up periodically at Down syndrome conferences is the reminder that we have to let/force our children to grow up. Julianna is seven and she thinks she has to have me put her shirt on for her. She still wears her underwear sideways (can you imagine being skinny enough for that even to be possible?). And I know she can’t brush her teeth well enough to be left on her own. It’s ridiculous that we haven’t tackled independence for her in these areas–but that’s a response to being so crazy-busy. With four kids and a mom who works at home, the practical aspects of life turn into an assembly line: meal prep, morning ablutions, bath time. The focus lately has been on getting Michael to talk. There’s only so much parental effort to go around. Sometimes you just opt to sacrifice independence to the concept of get it all done. But that’s not good enough anymore. It’s not fair to her. Because she isn’t a “little one” anymore. I have to stop treating her that way. This is a lovely snippet. I’m of grandmother age, but I love to see parents learning along with their children. P.S. It’s a snippet on the page but a major event in the actual life process. Very insightful. I especially relate to the limited parental effort part. I know we have been more relaxed on teaching independence to the younger kids. We didn’t have a choice on the older ones, because we were busy taking care of their younger siblings so they “had” to learn those things in order for the family to function. Amy’s comment shows us again how birth order plays such a definite part in the individual’s development of particular personality traits. Yes…but that birth order thing is tricky. I’ve always been suspicious of birth order traits, particularly the oldest vs. the youngest (shepherd/mommy figure for the former and black sheep for the latter)–because it hasn’t played out that way in three of the five families most closely tied to me. But the shepherd/caretaker thing definitely applies in my household!